In August 2004, the Marine EM Lab conducted a 25 site CSEM, MT and CSMT survey at Hydrate Ridge, offshore Oregon in order to asses the capabilities of the marine controlled-source electromagnetic method for in situ characterization of gas hydrates and gas hydrate bearing sediments. Karen Weitemeyer used these data for her PhD project, funded by the Seafloor Electromagnetic Methods Consortium. HyREX04 Cruise Report, PDF (1.5 MB). K. Weitemeyer, S. Constable, K. Key, and J. Behrens. First results from a marine controlled-source electromagnetic survey to detect gas hydrates offshore Oregon. Geophysical Research Letters, 33(L03304), 2006. (PDF, 700 KB). K. Weitemeyer, S. Constable, and K. Key. Marine EM techniques for gas-hydrate detection and hazard mitigation. The Leading Edge, 25(5) 629-632. 2006. (PDF, 424 KB). 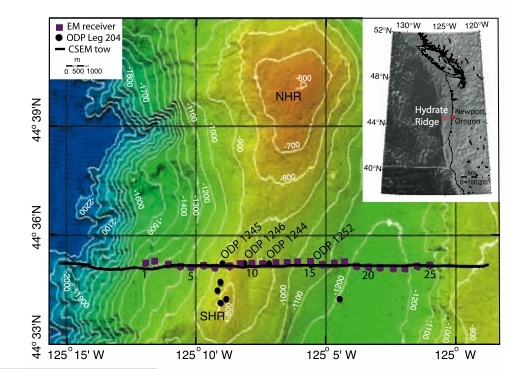 Karen Weitemeyer, Guozhong Gao, Steven Constable, and David Alumbaugh, First results from a marine controlled-source electromagnetic survey to detect gas hydrates offshore Oregon. Geophysics, in press (PDF, 12.8 MB). 2001). Inset shows regional location (ETOPO2 global relief from NOAA, 2001). NHR, northern Hydrate Ridge. 2D inversion of radial 5Hz CSEM data from Hydrate Ridge experiment. From Weitemeyer, Guozhong, Constable, and Alumbaugh, 2010, in press. Seismic data courtesy Anne Trehu, Oregon State University.